Due to poor planning on my part, Hello Kitty didn't get her steak fix last week. I was determined to make it up to her, so we made the trip down to the Steak House Winebar + Grill at the InterContinental Hong Kong. There are a number of steakhouses around town - both "homegrown" as well as branches of well-known international operators - but this was the only established deemed worthy of a macaron by the Rubberman. Now the world ain't exactly overflowing with macaron-encrusted steakhouses - even in cities like New York - so I figured I owed it to myself to check out how things are. After all, it's been a good 4 years since my last visit. The first surprise came when I called to reserve a table and the hotels' central restaurant reservations desk picked up the phone. The use of caller ID, plus what I'm sure is a world-class CRM system, meant that the person at the other end soon addressed me by name without the need for me to tell them who I am. That was a real pleasant surprise. As I've said, my last visit to the restaurant was 4 years ago, and to have hotel staff speak to me as if I were a long-time regular does kinda give me that warm-and-fuzzy feelin'. The second surprise came after we were seated. The restaurant's menu was rather large, and when we opened it up, it turns out these were simply two large tablets with backlit LCD screens. For someone who really hates not being able to read a menu in dimly-lit restaurants - and the lighting was definitely on the dim side here - this was the high-tech yet elegant solution. Besides the very nice bread basket, we also got some tortilla chips and deep-fried onions. Pretty decent. Crab cake "New Orleans" style, tartar sauce - this was pretty good, with plenty of delicious crab meat. But then again, at the price I'm paying... they'd damn well better deliver! 50 / 50: summer capsicum soup and lobster bisque - not wanting to choose between the two soups on offer, I decided to have both. I was a little surprised at the summer capsicum soup, because I thought it'd come cold like a gazpacho. Pretty nice flavors, though... with lumps of crab meat. The lobster bisque was pretty good, too... especially with those fatty croûtons. The thing with these high-end, fancy schmancy steakhouses is that they always play a few of the same gimmicks. First one would be a choice of salts to go with the steaks, and here we've got a choice of eight. Finally, there's also an array of mustards... but I don't eat my steak with any mustard. Dry aged prime bone-in sirloin, 24-oz - we were told that once the bone is taken out, the remaining beef would be about 14 ounces or so. Definitely enough for the two of us to share. In reality, though, there wasn't much bone here... so I wouldn't be surprised if we got 18 ounces or more of meat. These days if I bother to get myself a piece of steak, it's just gotta be dry aged. Nothing else can deliver the same depth of flavors... especially the bits near the bone. And medium-rare was just right. Roasted root vegetables - neither of us are fans of beets, but at least we got some carrots and celeriac. Garlic French beans - yum. 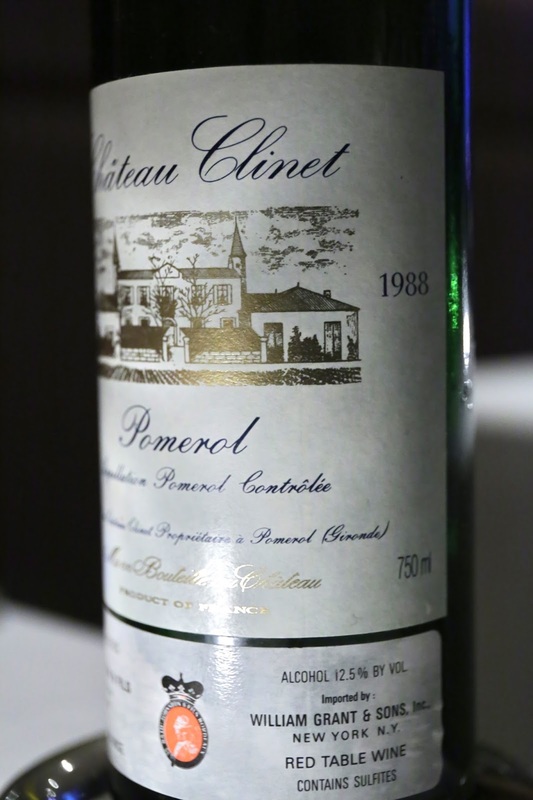 1988 Clinet - nice, sweet fruit, a little grassy, a little earthy. A little sweet on the palate, with smooth and velvety tannins.